Dr. Cuevas grew up in Reedley, California before making his way up the coast to Oregon for optometry school and then settled here in Eugene. Dr. Cuevas’ father was a college Biology professor who taught many pre-med, dental, optometry and nursing students. Being around these students and working in his father’s lab during grade school made him realize how much fun a health care career would be. After researching various healthcare specialties and spending time with his family optometrist, he decided to utilize his people skills and compassion for people with Optometry as his profession. 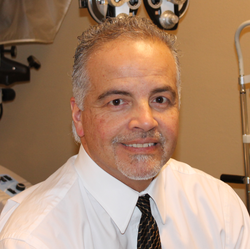 Dr. Cuevas started his optometric career with a unique undergraduate degree in Visual Science and went on to receive his Doctor of Optometry in 1986 from Pacific University College of Optometry, Forest Grove, Oregon. While considering himself an optometrist for the entire family, Dr. Cuevas specializes in difficult to fit contact lenses as well as pre-operative LASIK and cataract support and post-operative care. Dr. Cuevas founded the practice in 1990. While Dr. Cuevas has many patient success stories, his favorites are those from his overseas charity work in which he has have participated in 19 overseas “Gift of Sight” international eyecare missions since 1992. There was an older lady in southern Honduras who after receiving her high prescription glasses and actually seeing for the first time past the end of her arms laid down her cane and walks steady and confidently pointing at her field of goats and being able to identify her grandchildren by sight and not just by their voice. When not seeing patients, Dr. Cuevas enjoys physical exercise, hiking, traveling, landscaping, photography and spending time with his wife and daughter.